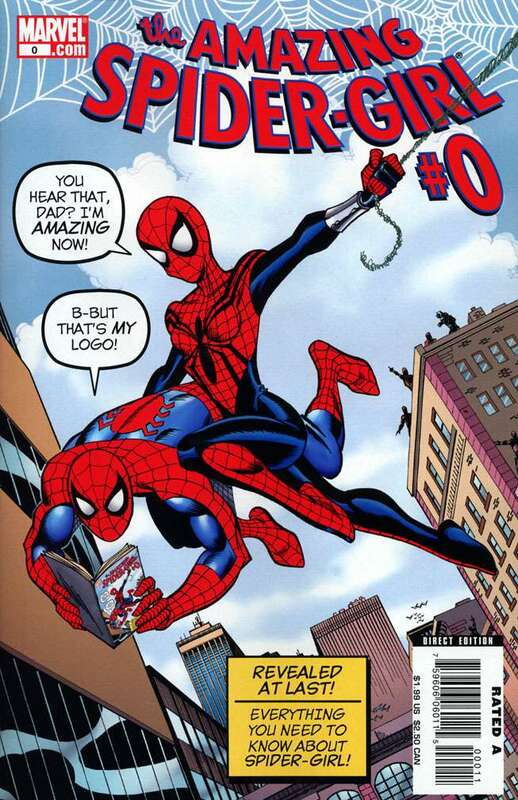 It’s worth noting that while FF and Wild Thing were canceled, Spider-girl at that time was selling well over 36K copies, falling between #56-59 on the top 100 sales chart every month. It wasn’t setting the charts on fire, but it was doing well enough to stick around. The Buzz – Honestly, the most important thing to know about this series is that Ron Frenz penciled it, keeping him as an active member of the larger MC2 creative team. 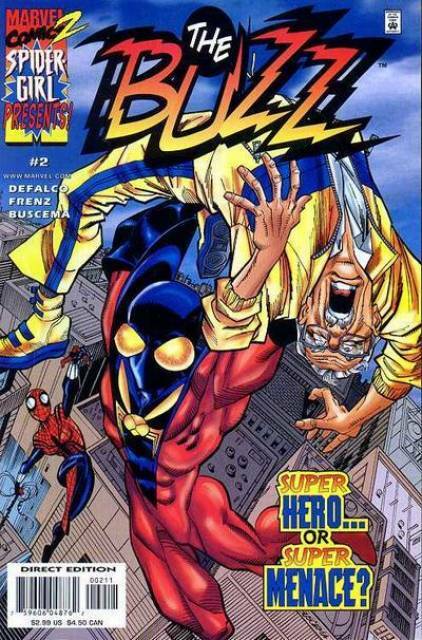 The Buzz himself is a fairly standard character, a teenager thrust into a situation far above his head. He also happens to be J. Jonah Jameson’s grandson. The series is only 3 issues which is the right length for a story starring The Buzz. Darkdevil – Darkdevil is one of the first mysteries introduced in Spider-girl, a character who seems to be a demonic version of Daredevil. there’s more to it than that but I won’t spoil it for you. Darkevil dips back into some serious Spider-man history, though, which makes him more interesting than The Buzz. And, again, Ron Frenz pencils this limited series. Having him handle part of the art chores on these books does wonders for maintaining a certain quality and tone level throughout the MC2, particularly since Frenz eventually takes over on art on Spider-girl. The MC2 as we knew it was more or less over with the end of the Buzz and Darkdevil limited series. After that, the only book that Marvel was willing to take a chance on was Spider-girl, and even she was in constant danger of cancellation. It was kept alive by constant fan campaigns and the release of digest sized collected edition which, it should be noted, is how I discovered the series. The expanded MC2 still got love in the pages of Spider-girl, too, as the main plot line in the Fantastic Five was resolved in Spider-girl, six years after it had been introduced. But for nearly four years, Spider-girl represented Marvel’s least grim possible future by herself. It’s an entertaining series featuring great art by, you guessed it, Patrick Ollife. The end of the series features the death of an iconic Marvel hero. 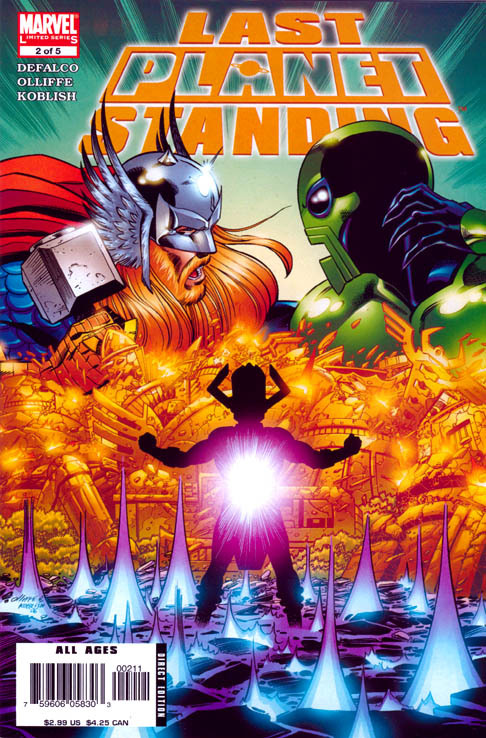 There would be a follow-up series of sorts in 2006 called “Last Planet Standing.” Again, it featured great art from Patrick Ollife and Scott Koblish and again it featured the entire line. As the title implies, this story was a bit bigger than the last one and featured the end of yet another iconic Marvel character (or two). It’s hard to argue with Marvel renumbering the book. It’s an easy way to increase sales, at least for one issue, and it might just get more people to give Spider-girl a shot. 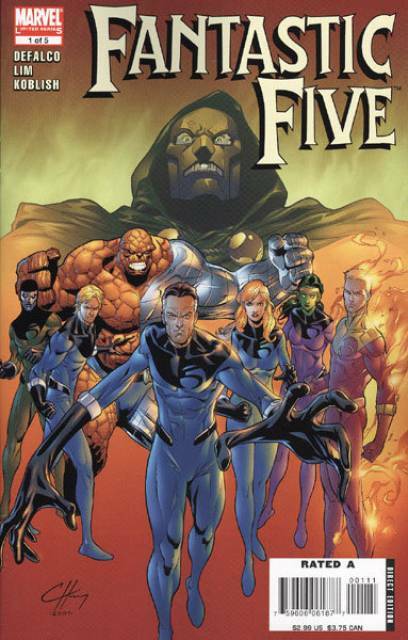 The new #1 must have done something right because the trend of another 5 issue series each year doubled in 2007 with a new Fantastic Five series and a new Avengers Next series. 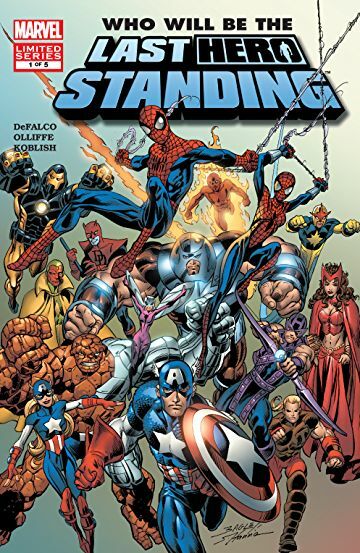 While “Last Hero Standing” and “Last Planet Standing” didn’t make drastic changes to the MC2, at least none that impact the line directly, this new FF book introduced a new status quo for the team. Naturally this came about due to the action of Dr. Doom, more powerful than ever. The finite nature of the series works towards its advantage and it moves at a mile a minute. It also features some great art by Ron Lim and Scott Koblish, bringing Lim back again and keeping the art in the MC2 line consistent. Lim and Koblish are also the art team on the Avengers Next book that also came out in 2007. Aside from a bit too much time spend on the questionable character Sabreclaw, it’s a great series. It also underscores what a boon Koblish’s inks are to Lim’s pencils: they’ve never looked as dynamic or vibrant. Amazing Spider-girl spends much of 2007 and 2008 dealing with the Hobgoblin and, given the creative team, gives the book a real 80s Spider-man vibe. The big storyline in 2008 is “Brand New May,” a play on the then current “Brand New Day” going on in the Amazing Spider-man book. This brand new May refers to a clone of May found in a lab that used to belong Norman Osborne. It’s suggested that this is the real May and the one we’ve been following all this time is a fake. This picks up on a long dangling thread in the Spider-man books. Towards the end of the Clone Saga, Mary Jane had a baby that was stolen by a woman who supposedly worked for Norman Osborne. The backstory is filled in here showing that Kaine rescued baby May — or did he? 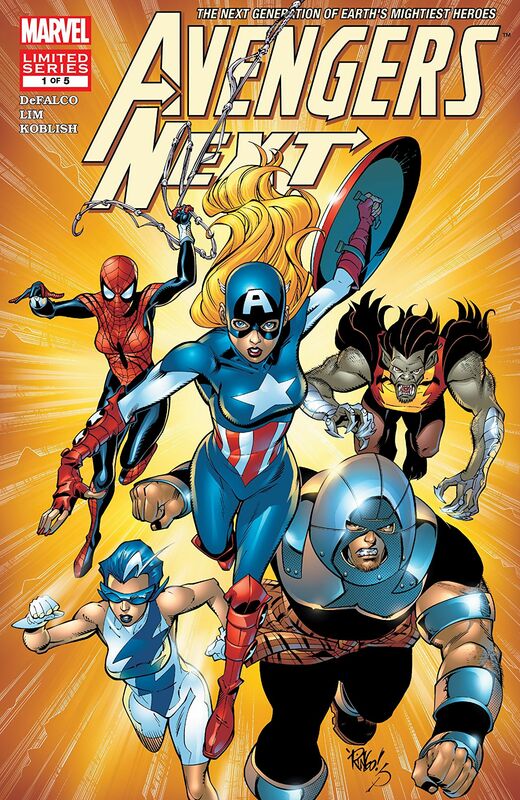 The 2008 limited series features American Dream, the Captain America style character introduced in A-Next #4. 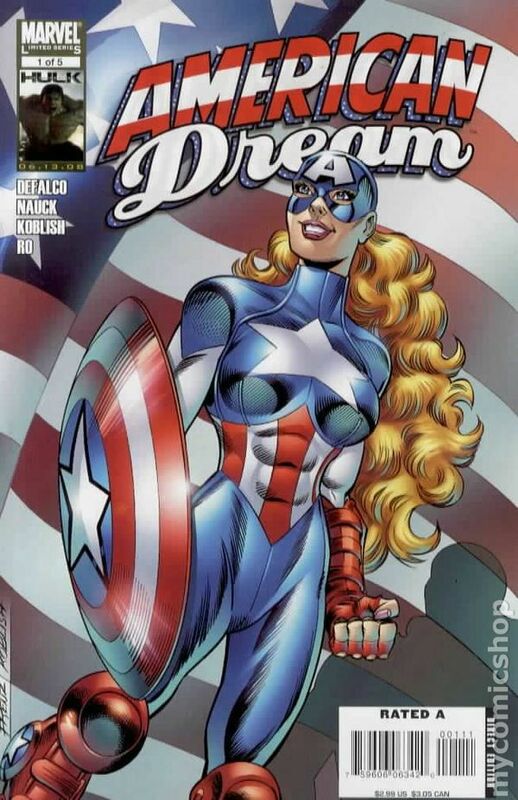 She would later appear in a series called the Captain America Corps, a book about various versions of Captain America throughout time. At the very least, it connects her to the large MCU. Her limited series is drawn by Todd Nauck and Scott Koblish and, again, Koblish’s inks really shine. He really became an unsung hero on the non-Spider-girl titles and a welcome addition to the MC2 stable of creators. Nauck is also a nice addition and his pencils have never looked better. But despite the Spider-girl digests and the annual second series, the MC2 was not long for this world. Only a handful of issues of Amazing Spider-girl would be released in 2009 before the series was canceled with #30. First, May’s adventures moved to the Amazing Spider-man Family anthology. But if you didn’t want to buy the anthology, you could by digital copies of just the Spider-girl stories in the pages of her own book, the Spectacular Spider-girl. You could only get it digitally, though, or buy it in print in Amazing Spider-man Family. 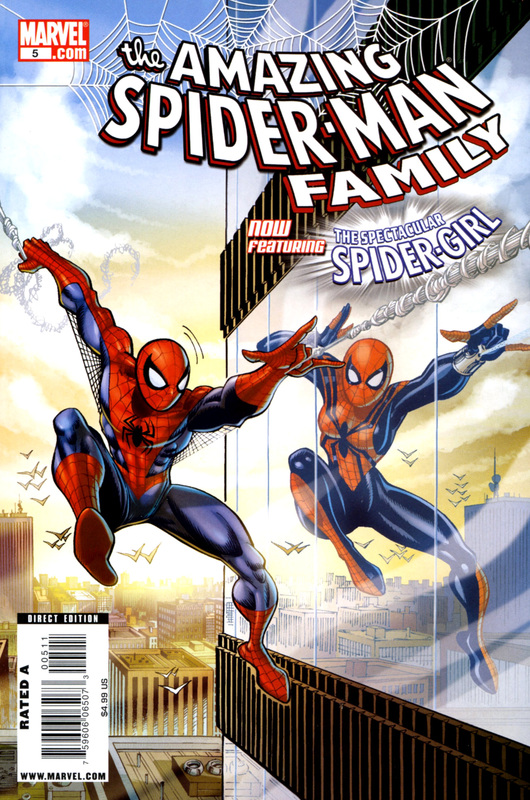 While the digital only series continued on, Amazing Spider-man Family ended, so the print version of Spider-girl’s stories moved to a new Web of Spider-man series. That would only last for 4 issues, though, before Spider-girl moved to a new print comic of her own, called…Spectacular Spider-girl. So, yes, there are two Spectacular Spider-girl series. 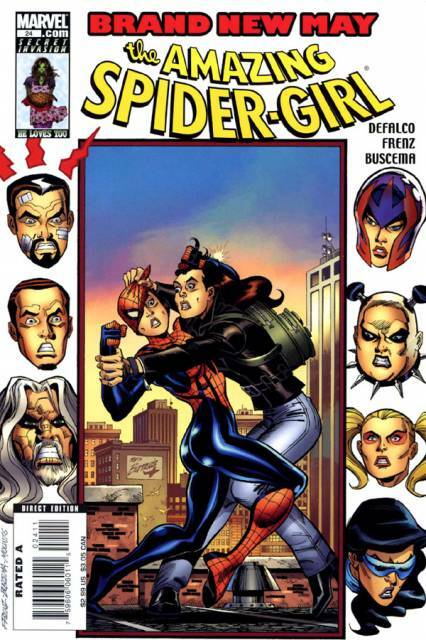 The 4 issue print Spectacular Spider-girl series attempted to wrap up as many story lines as it could and bring the series to a satisfactory conclusion. 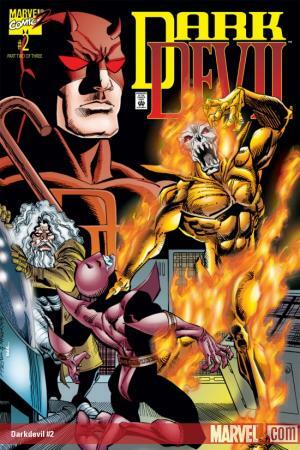 The bulk of the series revolved around a gang war and focused on tying up the story of the Hobgoblin, as well as sending the clone on her own way. It’s a perfectly fine ending, but we would get a better one with Spider-girl: The End, a one shot in keeping with the other “The End” books that Marvel had put out for its various characters. While the last series sent the clone on her way, this issue ended that story once and for all. It also gave May a happy ending in her social life for once. The End opens with Mayday in the far future, which would be a possible future for this book which is also a possible future of what is an alternate reality. Mayday would next appear in Amazing Spider-man v3 #8, part of the Spider-verse crossover. I understand that the story was supposed to upset me and I’m not remotely objective when it comes to Spider-girl, but I’m of the opinion that Amazing Spider-man v3 #8 is bad. I’d go so far as to say the entirety of the Spider-verse crossover is bad. Here’s the thing: there are many different versions of Spider-man because people like to read about variations on a theme. And those different versions of Spider-man are, more often than not, set apart from the main version by style and tone. Mayday is not Peter Porker is not Spider-man and his Amazing Friends is not Spider-Monkey is not Spider-man Noir. That is the appeal and the reason for their existence. Spider-verse ignores that completely and, even worse, destroys it. Spider-verse is so tone deaf it’s nearly impossible to read. But there’s a silver lining: this is comics. There are alternate timelines of alternate realities and I’m sure in one of them Spider-verse never happened to Mayday and her family. That’s a reality I would love to visit again someday. Thanks so much for writing this. Spider-Girl is one of my favorite series of all time, and I refuse to even acknowledge what they did to it in that pointless crossover. Also: I ordered the new “Complete Collection,” and was pretty disappointed by the quality of the print job. The cover is made of the same stock as the interior pages, and the whole thing feels really cheap, especially for the price tag. Anyway: here’s to Mayday! I guess this is “good” to know as the collection has been on my wish list for a while now, but I’d heard that Marvel had switched to really cheap stock for their larger collections lately. I’ve heard the same about their most recent Epic Collections, too. Just another last insult to the character!